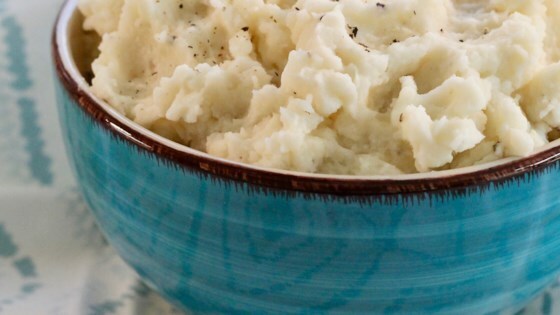 "If you love good, old fashioned mashed potatoes this is the perfect recipe. Simple and delicious." Bring a pot of salted water to a boil. Add potatoes and cook until tender but still firm, about 15 minutes; drain. In a small saucepan heat butter and milk over low heat until butter is melted. Using a potato masher or electric beater, slowly blend milk mixture into potatoes until smooth and creamy. Season with salt and pepper to taste. See how to make good old-fashioned mashed potatoes. Perfect mashed potatoes. Heating the milk and butter is a must, I didn't realize what a difference it would make, my potatoes were not gummy and they stayed hot longer. There isn't enough butter in these mashed potatoes, you should have a least a stick of butter. I make mashed potatoes all the time and everyone just loves my potatoes. Great basic recipe. If you're watching your calories etc, try substituting the potatoes starchy cooking water for most of the milk. After that, only a quick splash of milk is needed. I have been looking for a recipe for good, old fashioned, mashed potatoes like mom used to make. This is it. Thanks!